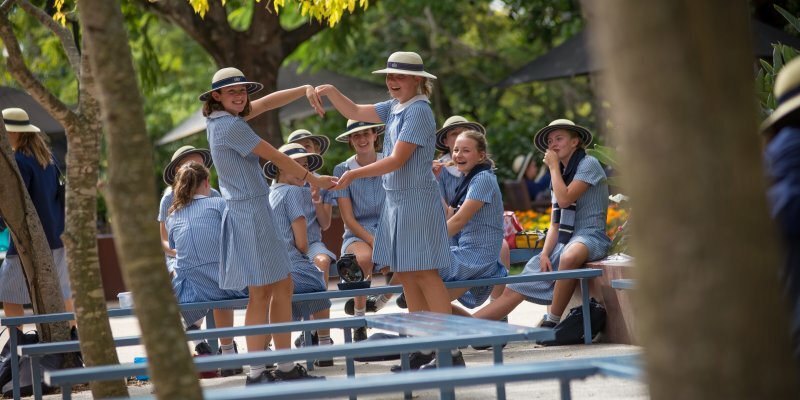 Stuartholme’s Student Wellbeing Program is framed and infused by the Goals of Sacred Heart Education, and permeates every activity and interaction in the School. Together we strive to celebrate successes, support one another through challenges, and create a community that lives out the spirit of Cor Unum – which means ‘One Heart’. The School’s academic program is strongly supported by the Student Wellbeing Program. We believe that you can never look at academic results without looking at the girl behind them. Observations on attitude and engagement form just as big a part to the picture as the grade a student receives. As educators, we know both empirically and anecdotally how important it is for each girl to be healthy; physically, socially, spiritually and emotionally so she can perform her best academically. All members of staff play specific roles in caring for the girls, and are considered part of the Student Wellbeing team. Each person seeks to model and teach the skills needed to build a sense of community and practise clear, direct and open communication. The Student Wellbeing staff work closely with teachers in each year group to monitor the academic care of the girls in their cohort. The Student Wellbeing structure is made up of six groups per year level, with between 13 and 24 students in each group. These groups are categorised by Houses; each named after influential Religious of the Sacred Heart. Year 12 Teacher Mentors take on the responsibility of working with the Year 12 students to lead their Houses and oversee House activities. The Student Wellbeing Program covers a variety of age-appropriate topics for each student cohort. Relevant content around the areas of resilience, time management, mindfulness, career guidance and personal and online safety are integrated into the program.